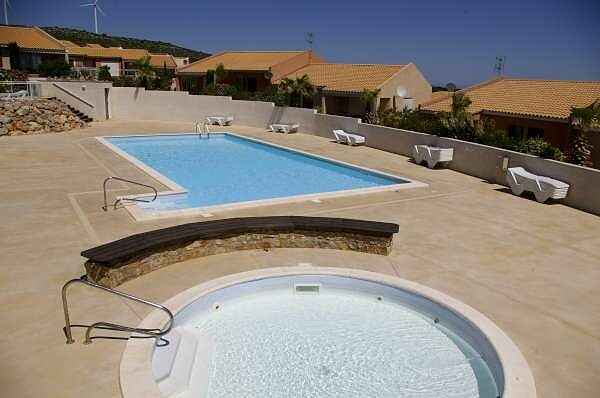 A newly built 2 bedroom ground floor apartment on a stunning hillside location above the village of Fitou with stunning views from the terrace of the salt water lagoons and Mediterranean sea. The living area is modern and well furnished with red leather sofas. Outside there is a patio with garden furniture and a barbeque. Steps lead from the patio into a small garden area. The development also has 2 large swimming pools (one is heated) and one small toddler pool. Walking distance to the wine village of Fitou is approx 10 mins. Ideally located as a base for a range of activities, whether it be golf, walking, bird watching, sampling the local Fitou wine or just lying on the beach in summer or skiing in winter (1.5 hours from the Pyrenees ski slopes). The apartment has 2 double bedrooms and sleeps 4 people. Its has a spacious open-plan living and dining area, a fully fitted kitchen with dishwasher, bathroom with glass shower cubicle. The apartment has a terrace with magnificent sea views, steps from the terrace lead into a small garden. The apartment is located on a stunning development of apartments and villas. There are two swimming pools, one of which is heated from April until October. There is also a toddler pool. The development has communal gardens which are beautifully landscaped with Mediterranean trees and shrubs.